Hey! Come on, boys! It is time for you to choose a new dress for the coming of spring. Have you already got a full preparation for your spring? I believe that you will love this fashion and cool elbow patch blazer at the first sight. This new arrival is one of the hottest products sold in our website, and it deserves your serious considerations. When I see this elbow patch blazer, it reminds me of the Chinese tunic suits which are very popular before 1980s. It is one of the main and popular dresses that male people will wear. This kind of Chinese tunic suits are named after the famous leader: Zhongshan Sun. The greatest advantage of this Chinese tunic suits lie in its simple pattern and various plain colors. The design of this clothing is very suitable and fit for men’s figure and will show your good body proportion. As for the very beginning, it was more often worn in formal occasions. Right here, you will find that this elbow patch blazer has something similar to the Chinese tunic suits, right? Of course, you are rare to see people walk in the street wearing this sun yat sen’s uniform nowadays. However, you will see some creativity on these dress with the reflection of these fashion classical clothing. The new designed clothing is more comply with modern fashion trend and modern people’s taste. 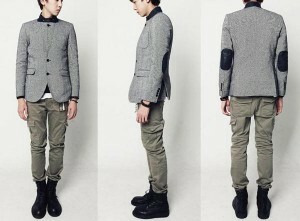 This elbow patch blazer will definitely arouse a new fashion wave in young people in a short time. You can see that many stars are wearing this fashion blazer perform in a TV shows and TV programs, especially Korean stars. This elbow patch blazer has a good combination of fashion style and good quality. It will definitely become your spring necessity to show your mature and cool temperament. Don’t miss such a good chance to buy this fashion and cool new arrival!